4th Annual SHOOTING FOR THE STABLE Benefit! 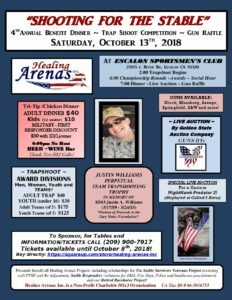 – Healing Arenas, Inc.
Join us for another fun event held at the Escalon Sportsmen’s Club October 13, 2018! Trapshooting competition from 2 to 6pm, Dinner and Live Auction/Gun Raffle at 7pm!